The world’s press was watching and listening in 1925 when, at the famous Scopes Trial1 in Dayton, Tennessee, William Jennings Bryan (seen as the man representing Christianity) was cross-examined about his faith. 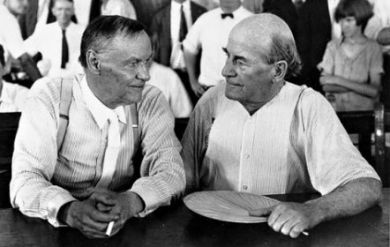 Clarence Darrow (left) and William Jennings Bryan (right) at the Scopes Trial in 1925. Right there, I believe, Darrow knew he had ‘won’ the trial in the public mind! As a humanist, Darrow knew that the language of Genesis 1 was clear, and taught that God created in six literal days. But he knew that if he could show the world that Christians really didn’t believe the Bible like they purported to, he could persuade many that Christianity was a bankrupt belief—which is what he really set out to do in this trial anyway. This was a turning point in Christendom, and the Christian influence in our culture has declined ever since. Bryan unlocked a door—on behalf of Christians, he ‘told’ the secular world that Christians really didn’t take the Bible as seriously as they claimed. This seriously weakened the authority of the Bible in the eyes of the public. So it is not surprising that today’s church leaders not only question the days of Creation, like Bryan, but increasing numbers of them have gone on to disbelieving in the bodily Resurrection or the Virginal Conception of Christ, and no longer affirming marriage as heterosexual-only. Before discussing this, consider the ‘big picture’. Before World War II, around 40% or more of the population of England attended church. However, an independent UK news source3 recently published statistics for all denominations, showing that in the last ten years only 7.5% of the population went to church. They predicted that at the present rate of decline the church would be ‘dead and buried within 40 years’, with only 0.5% of the population attending services. Though people may argue about statistics, there is certainly very little of Biblical Christianity remaining in English public life. Many church buildings have been turned into offices, shopping centres and the like. The once-pervasive Christian influence throughout the American culture has greatly waned as well. It could be said of the USA that Christians are ‘losing the culture’. Many other countries once influenced by the Christian worldview are also losing or have lost most of this Christian thinking. The reason we know that Jesus Christ died and rose is because of what is written in the Bible—on the authority of the Word of God. The plain words of Scripture are taken in context, according to the type of language and literature in which they are written, as a reader of that time and culture would have understood it. This is called the ‘grammatical/historical’ approach to hermeneutics (interpretation of Scripture). We certainly don’t ultimately accept the Resurrection from the scientific evidence—we didn’t see Jesus rise from the dead (we only have historical records). If we had to trust modern science, we wouldn’t believe in the Resurrection at all, as the scientific establishment would reject the claim that a human being could be resurrected from the dead. ‘We have to admit here [concerning those who take the six days of Creation as literal days] that the exegetical basis [the arguments from the words of Scripture] of the creationists is strong. … In spite of the careful biblical and scientific research that has accumulated in support of the creationists’ view, there are problems that make the theory wrong to most (including many evangelical) scientists. … Data from various disciplines point to a very old earth and even older universe.’ 5(emphasis added). One wonders if Hodge would still say the same thing if he were to see this very pagan institution (Princeton University) today—for instance, its hiring of pro-infanticide, pro-euthanasia philosopher Peter Singer. Of course, there were other influences at Princeton, but one needs to understand the ‘big picture’ of why a college like this loses its Christian foundation. Even though Hodge and Warfield were Christian ‘greats’—and even though much of their teaching was Biblically sound—sadly, they helped ‘unlock a door’—the door of compromise—the door to help begin the undermining of Biblical authority. Once Christians concede to the world that we don’t have to take the words in Genesis as written, but can use outside beliefs (e.g. age of Earth) to (re)interpret Scripture—then the door to do this throughout the whole of Scripture has been unlocked. Once this door is unlocked, subsequent generations push it open even further. 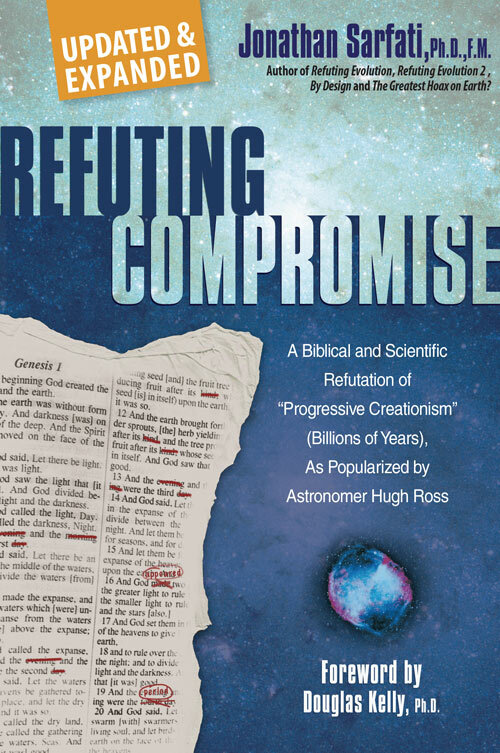 There are a number of instances throughout the Bible where one sees compromise in one generation, and in the next, the compromise is usually much greater. It doesn’t take long before the godly foundation once there is eroded (e.g. the kings of Israel; and in light of Exodus 20:4–6 concerning idolatry, consider 2 Kings 14–16). Now it is true that whether one believes in six literal days or not doesn’t ultimately affect one’s salvation, if one is truly born again. However, we need to stand back and look at the ‘big picture.’ In many nations, the Word of God was once widely respected and taken seriously. But once the door of compromise has been unlocked, once Christian leaders concede that we shouldn’t take the Bible as written in Genesis, why should the world take heed of it in any area? Because the church has told the world that one can use man’s interpretation of the world (such as billions of years) to reinterpret the Bible, it is seen as an outdated, scientifically incorrect ‘holy book’, not intended to be taken as written. As each subsequent generation has pushed this door of compromise open further and further—increasingly, they are not accepting the morality or salvation of the Bible either. After all, if the history in Genesis is not correct as written, how can one be sure the rest can be taken as written? Jesus said, ‘If I have told you earthly things, and you do not believe, how will you believe if I tell you of heavenly things?’ (John 3:12). It would not be exaggerating today to claim that the majority of Christian leaders and lay people within the church do not believe in six literal days—like Bryan, they have been influenced by the world to not take the Bible as written. Sadly, being influenced by the world has led to the church no longer influencing the world. 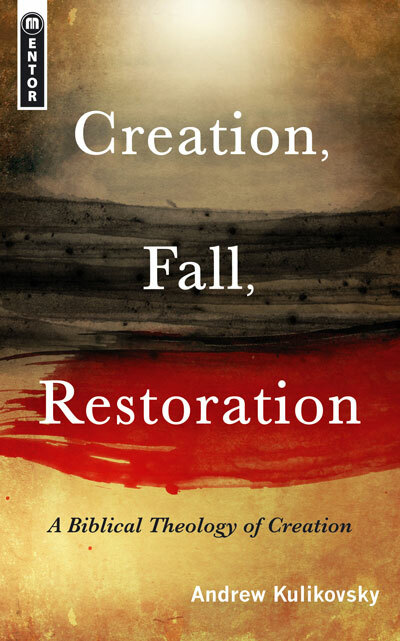 The collapse of Christianity in the once ‘Christian’ West is directly related to the issue of Biblical authority—which is directly related to the issue of the days of Creation. The battle is not one of young Earth vs old Earth, or billions of years vs six days, or creation vs evolution—the real battle is the authority of the Word of God vs man’s fallible theories. Those in the Church who do not accept God’s Word as written concerning the literal days of Creation have greatly contributed to the Christian demise of the culture, and will be held responsible before the Lord for leading so many lives astray. They have undermined the text of Scripture because they didn’t accept the words as written. Why do Christians believe in the bodily Resurrection of Jesus Christ? Because of the words of Scripture (‘according to the Scriptures’). And why should Christians believe in the six literal days of Creation? Because of the words of Scripture (‘In six days the Lord made …’). The real issue is one of authority—is God’s Word the authority, or is man’s word the authority? How the church answers this question will determine the future of the nations of the world. Ham, K., The wrong way round! 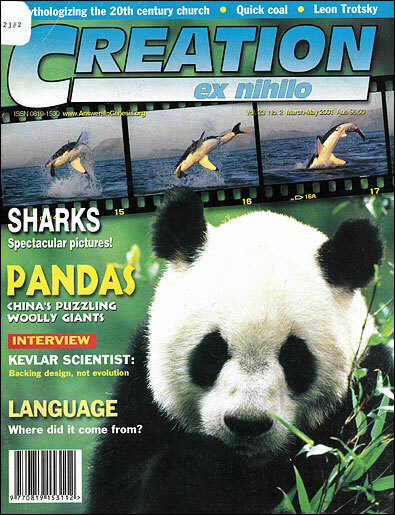 Creation 18(3):38–41, 1996; Menton, D., Inherit the wind: an historical analysis, Creation 19(1):35–38, 1997. Return to text. The World’s Most Famous Court Trial, Second Reprint Edition, Bryan College, Dayton, pp. 296, 302–303, 1990. Return to text. Southam, H., Church ‘will be dead in 40 years time’, Independent News, 28 November 2000. Return to text. Ham, K., A low view of Scripture, Creation 21(1)45–47,1998; Ham, K., A tale of two graves, Creation 16(3):16–18, 1994; Ham, K., Millions of years and the ‘doctrine of Balaam’, Creation 19(3):15–17, 1997; Ham, K. and Byers S., The slippery slide to unbelief, Creation 22(3):8–13, 2000; Ham, K., The wrong way round, Creation 18(3):38–41, 1996. Return to text. Montgomery Boice, J.L., Genesis: An Expositional Commentary, Zondervan Publishing House, Michigan, 1:57–62, 1982. Return to text. Hodge, C., Systematic Theology, Wm. B. Eerdmans Publishing Co., Michigan, 1:573, 1997. Hodge was probably referring to the usual humanist spin-doctoring of the Galileo affair, but for a more accurate portrayal, see Grigg, R., The Galileo twist, Creation 19(4):30–32, 1997, and Schirrmacher, T., The Galileo affair: history or heroic hagiography? CEN Tech. Journal 14(1):91–100, 2000. Return to text.